Who was Chief Joseph and why was this Native Indian chief famous? 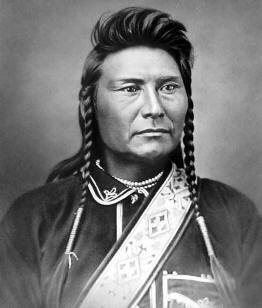 Summary: Chief Joseph (1840 - 1904) was a famous war leader of the Northwest Nez Perce Native Indians who fought against the white settlers who were confiscating Nez Perce tribal land. Chief Joseph formally surrendered to General Nelson A. Miles on October 5, 1877 in the Bear Paw Mountains of the Montana Territory. He died in 1904 in exile from his homeland. The following fact sheet contains interesting facts, background history and information about the life of Chief Joseph and the events in history that led to his fame as a great Native American Indian leader.